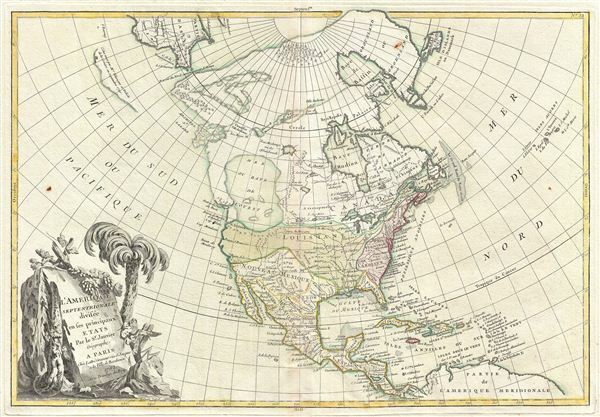 An altogether fascinating first edition example of Jean Janvier 1762 map of North America. Covers the continent from Panama to the Arctic Circle, extends westward to include parts of Asia and eastward as far as Iceland. This map, which is heavily influenced by the theoretical mappings of Guillaume de l'Isle and Philippe Buache, went through several states of which this is the first and possibly the most interesting. Javier divides the continent according to the three colonial powers that controlled it, with England controlling the colonies along the east coast, France occupying Canada and Louisiana, and Spain dominating Mexico, Florida, Cuba and Central America. These river and lake networks were being actively explored throughout the early 18th century by a number of little known but important French explorers. Most specifically the explorations of Verenrye with regard to the discovery of the Lake of the Woods (L. Des Bois) and Lake Winnipeg (L. Ouinipigon), both of which appear on this map. However, despite the activity of French explorers and fur traders in this region, the entire upper of the continent northwards of the Mississippi River watershed and the St. Lawrence River is not territorially assigned to any European Power. This little explored region was then subject to questionable colonial jurisdiction. The French claimed all of Canada while at the same time this region was in its entirety part of the Hudson Bay Company's royal charter. Legally this would be come much clearer in the year after this map was issued. In 1863, following the Seven Years War, France ceded nearly all of its North American territory to England. Nonetheless, this poorly policed and vast land remained hotly contested on the practical level as traders fur traders, backwoodsmen, and coureur du bois flooded the wilderness in search of its most treasured commodity, beaver pelts. The lower left hand quadrant is dominated by a large decorative title cartouche depicting some of the flora of the continent. Though most examples of this map are dated 1762, the map itself appeared in multiple states between its first edition in 1762 and final iteration in the late 1780s. We have identified at least four variants. The first edition, 1762, includes a large 'Sea of the West,' a series of lakes and rivers associated with the legendary voyages of Admiral de Fonte, and the Aleutians rendered as a single landmass, a la Muller. A second variant, possibly 1775, includes the De Fonte speculation, and the 'Lake of the West,' but renderers the Aleutians embryonically as a series of islands. Another third state, possibly from 1782, retains the 'Sea of the West,' but does not include the De Fonte discoveries further north, and the Aleutians are embryonically rendered as individual islands. There may be still other variations we have yet to discover, including a 1771 issue and a 1783 issue illustrating a post-Revolutionary War Untied States. A full series of these beautifully produced maps presents a thorough overview of the conceptual development of the American northwest prior to Cook. Drawn by Jean Janvier for issue as plate no. 32 in Jean Lattre's 1762 first edition issue of the Atlas Moderne. Lattre, Jean, Atlas Moderne ou Collection de Cartes sur Toutes les Parties du Globe Terrestre, (Paris) 1762..
Phillips (Atlases) 629-33. Wagner, H. R., The Cartography of the Northwest Coast of America to the Year 1800, 559. Wheat, C. I., Mapping of the Transmississippi West, 1540 - 1861, 192. Sellers, J. R. and Van Ee, P. M., Maps and Charts of North America and the West Indies 1570-1789, 93. McGuirk, D., The Last Great Cartographic Myth: Mer de l'Ouest, no. 109. Lowery, W., The Lowery Collection: A Descriptive list of Maps of the Spanish Possessions within th present limits of the United States, 1502 - 1820, 663. Sellers J., and Van Ee, P., Maps and Charts of North America and th West Indies, 1750 - 1789, 93.